Today, we are extremely excited to give an extra helping hand to the authors in our community (or those who have authors as clients) by providing a brand new, free Divi layout that can be used as a homepage or landing page for book(s). This layout is a combination of elegance, seriousness, and fun; the ideal way to inform your audience about your new book! We recommend using this layout as a starting point and modifying your homepage until it’s in the same style as the book you’ve written. Represent the emotions, content, and experience of the book by integrating certain aspects of it in your design and structure–the same way we did in this Divi freebie. We made the layout for a book with breakfast recipes but don’t worry, this structure can easily be used for other book topics as well if you change the images that are used. Although this is just a homepage and not a complete site package, this design will help you get started and maintain a certain design consistency throughout your whole website. All sections are reusable, responsive, and can make sense in different parts of your website. If you want to download the Elegant Authors layout for free, enter your email address in the form below and click on the download button. If you’re already subscribed to our newsletter, entering your email address will not cause you to resubscribe. elegant-authors-master.json – importing this file will add the full layout and all of the individual sections to your Divi Library. elegant-authors-full-layout.json – this is just the full elegant authors layout. sections folder – this folder contains all of the JSON files for the six individual sections of the elegant authors layout. gallery images folder – this folder contains the four sample images used in the gallery module of the elegant authors layout. This freebie will appear in your downloads folder as a zipped folder. To get started you’ll need to locate and unzip that folder for use with Divi. For a quick guide on getting started with Elegant Authors, check out the sections below. This will load the Elegant Authors full layout onto your page. Don’t forget to set this page as your front page in the WordPress settings so it automatically becomes the main page people land on when they visit your website. The layout we designed is composed of 7 sections in which there are elements that complement each other and deliver a fully interactive page. For the purposes of this post, we won’t need to do anything with the footer section though. Below I’ll walk you through each of the six main sections, one by one. This section has one row which is divided into two columns. As you will notice, the left side contains the image of your book. Replace this image with the image of your own book cover, preferably a PNG or JPG image that works well with your background image or color. These are regular testimonials put into a row with only two columns. Decide whether or not you want the quote icon to appear by making it visible or hidden. Increase the number of pixels if you want to create a bigger shadow effect or delete the code if you want none at all. Within the RGBA brackets of the code, you can decide what color you want your shadow to be. You can notice that the title section is in the same style, in each section but with a different structure that creates a certain connection between the different sections. You can also choose how many blurbs you want to get integrated into the second column of the page. Each of them has the possibility to add an icon )like the talk balloon you can see on the top) but in this case we chose only one that represents all three blurbs. The gallery module is another feature you can do a lot with. You can choose how many pictures you’d like to get displayed on the homepage, in what order you’d like to see them and you can immediately add a title and description to the image that helps your audience understand what you’re talking about. In this case, we have not added any titles or description to put 100% of the focus on the images. This, of course, depends on what kind of book you wrote. In cooking books, the visual side of food can be a great customer attractor, but in other types of books more explanatory text can fit better. You will likely notice that when you first load the layout, the gallery is either empty or filled with random images. This is because gallery images do not export with a layout or section. We have included some sample images you can use in the layout pack’s zipped folder. To add them, go to the general settings tab of the gallery module. Click the “update gallery” button and add the images provided. In this section, we decided to let the titles overlap with one of the other columns to create a bit more interaction between the elements. You can choose how much you’d like the two text modules to overlap with each other by modifying the top and bottom margins in the ‘Advanced Design Settings’ tab of your text module. You can setup how much you’d like your titles to interact with the nearest column by changing the percentage or pixels in the right margin. For the contact section of the homepage, we decided to go with a clean style that would work well with a relevant background image. When customizing to your own needs, search for the right image and make sure the background color or pattern on the side of the form doesn’t make the contact form look too complicated, busy or unreadable. The dimensions of our image is 1600px wide by 575px high. For the contact form you can choose the position of each field people are required to fill in. In this case, we made the name and email address sit on the same line while the message box is on its own line and full width. 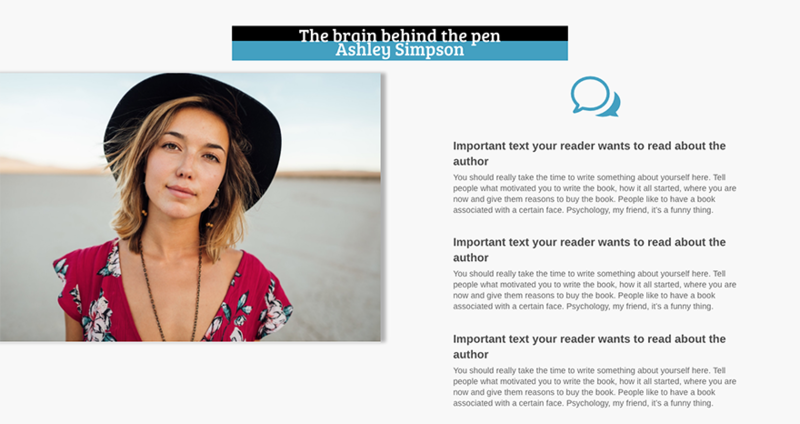 We hope all authors can get started on their own Divi website as easily as possible with this layout. This looks great. It’s something that I’ve been hoping to find for awhile now. Thanks for this layout pack. Thank you and have fun using it! Wow, this is beautiful. Thank You! Thank you, good luck with the book! Awesome! I’ve been waiting for a book / author layout! Minimalist and targeted – a deadly combination and sure success formula for better conversion. Happy you like it, Anurag! You have no idea how much I appreciate this download. I love each of you like family for all of the effort and trouble you put into the Elegant Themes process. Thank you each so much! The Elegant Themes is indeed a great community to be part of! Thanks for this new layout!!! I use the divi theme on my site and I like it very much! How to delete the post meta data from the blogs? Thanks. Will keep this in mind for future book author clients. Would there happen to be a demo of this? Excellent this is beautiful. Thank You! Already your client and subscribed, why you cant make this login work properly so people like me dont need to subscribe over and over to your spammy website. At least make a separate forum section where we can download all this “extras” without be endlessly asked to subscribe. Nice layouts, Thanks you so much. This is great. I’ll be able to use it with clients and I think it will work well as an enticement to get a free white paper from my agency. This will help me build my list! Thank you! Yes, you can easily customize the background colors within the General tab in the settings of each section. Great to be able to import layouts like this with Divi – a real timesaver. When I try to install the Elegant Authors theme it says it is not able to install because it is missing the CSS stylesheet. How to I get that to install? If you’re trying to install it as a theme that is the problem. This is a layout pack that should be installed as the post directs via the Divi Library. Nice layout. I’ve implemented it on my author site. Only problem is the text for titles in the gallery and extra info section is being cut off on mobile phones. It would be really nice if when you were releasing a new layout if you could release it for Divi and Extra at the same time. I am finding I selected Extra for the flexibility etc but not a lot of support or layout and module additions offered or extra tutorials it is getting frustrating when it takes hours to find a solution only to have it listed for Extra and not work or it’s only for Divi Builder or Divi, a lot of trial and error, mostly error.